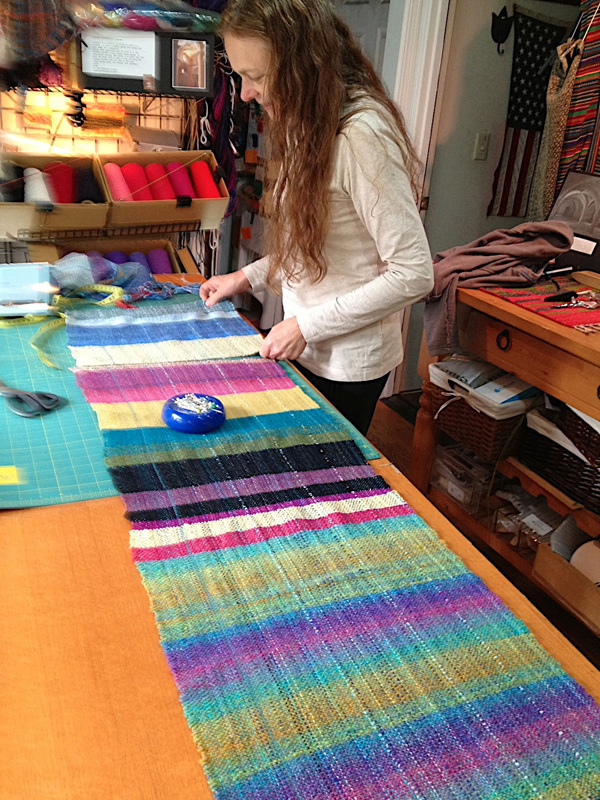 Saori Santa Cruz weaving studio is open by appointment. Flexible hours throughout the week and some weekends 10-5. Advance scheduling and payment required. 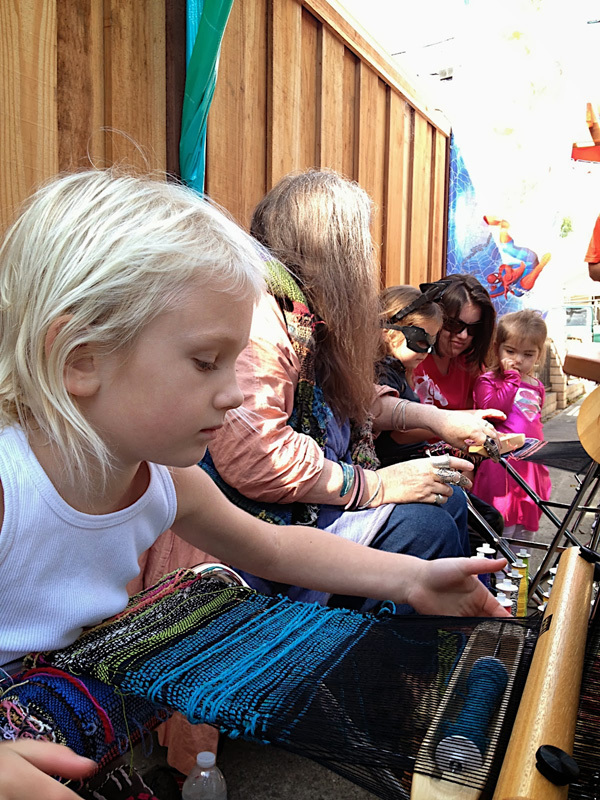 Saori weaving, learn to spin, and sewing classes are for children through adults and no previous knowledge is needed for the Beginning Spinning and "Try It" saori classes as well as Beginning Sewing. 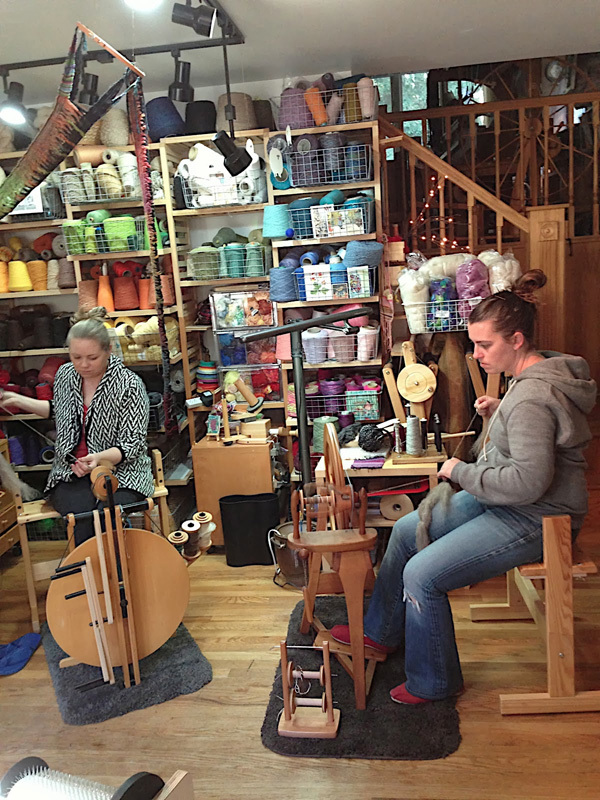 We have saori floor looms and saori warping and weaving equipment plus shelves and shelves of yarn to chose from. We also have sewing machines and clothing construction tools at your disposal so you can transform your hand weaving into your own unique look. 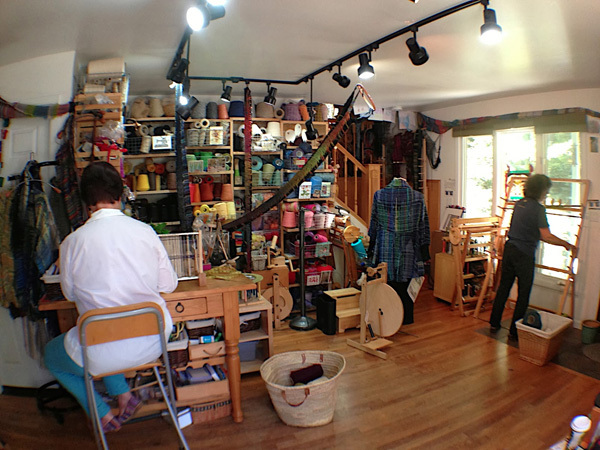 Additionally, we have spinning wheels, hand and drum carders as well as fibers, also Jacquard dyes. All students must be pre registered and prepaid for classes. Contact jill@saorisantacruz.com to schedule and register. 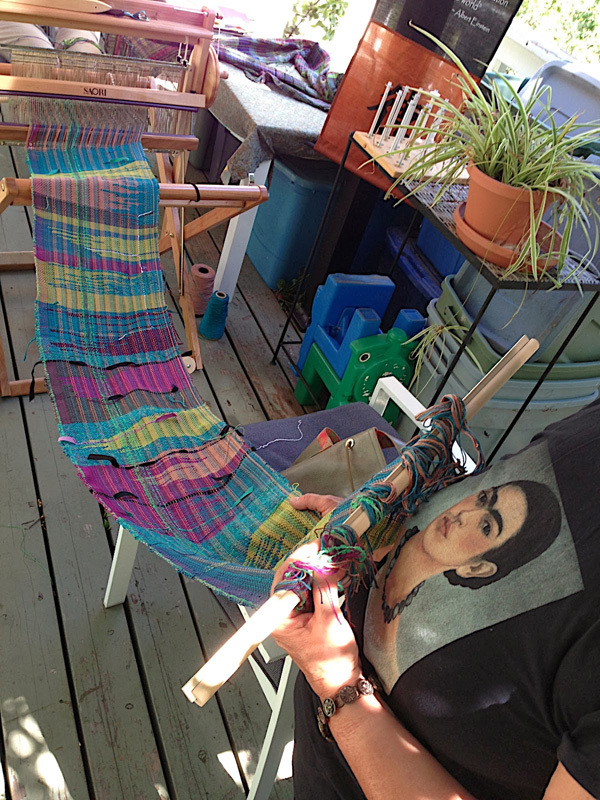 This is a 2 hour introductory to weaving class to see how you like saori free form no rules weaving. 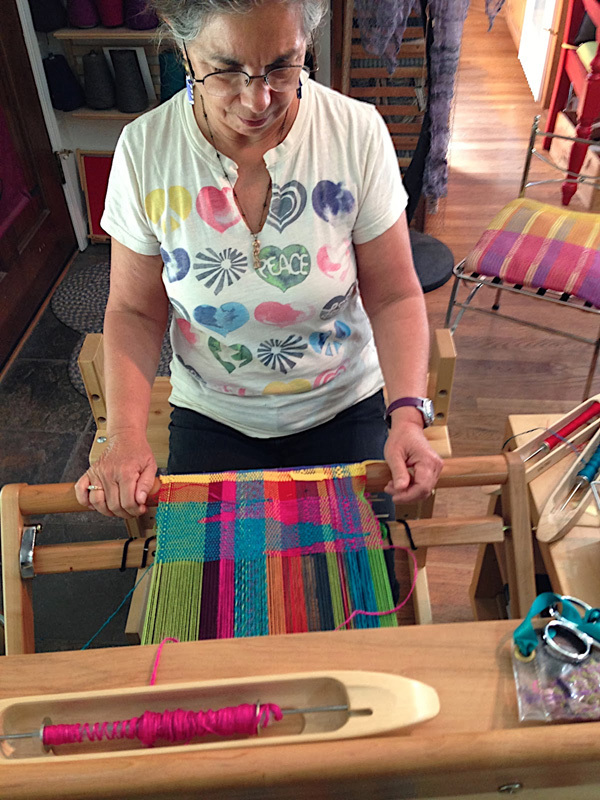 No prior weaving experience needed. 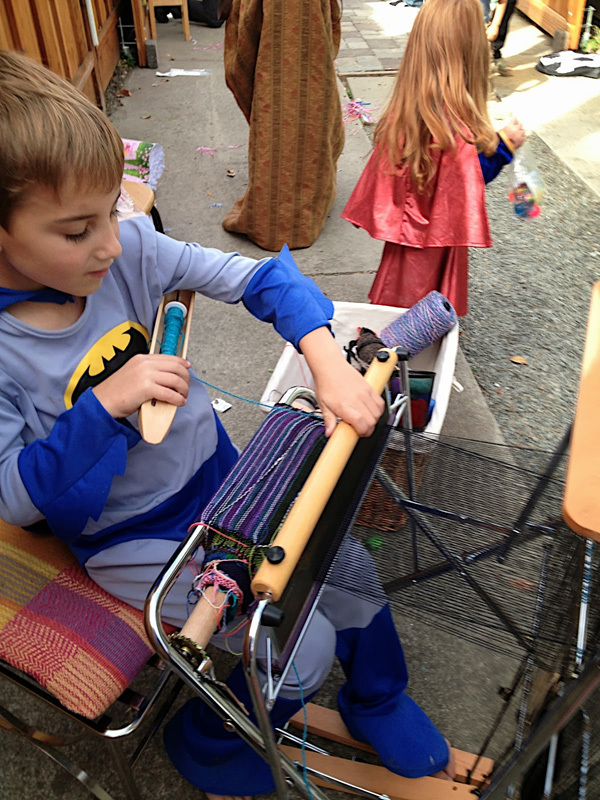 Children through adults can come and weave even if they have never held a shuttle or don't even know what a loom is. 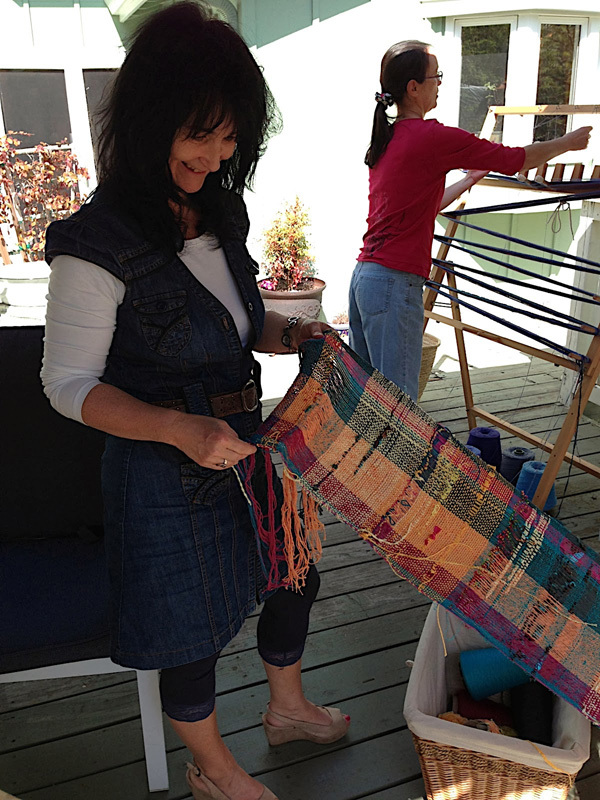 Come with your friends or family for a no stress exploration into the world of saori weaving. A small materials charge is applicable. 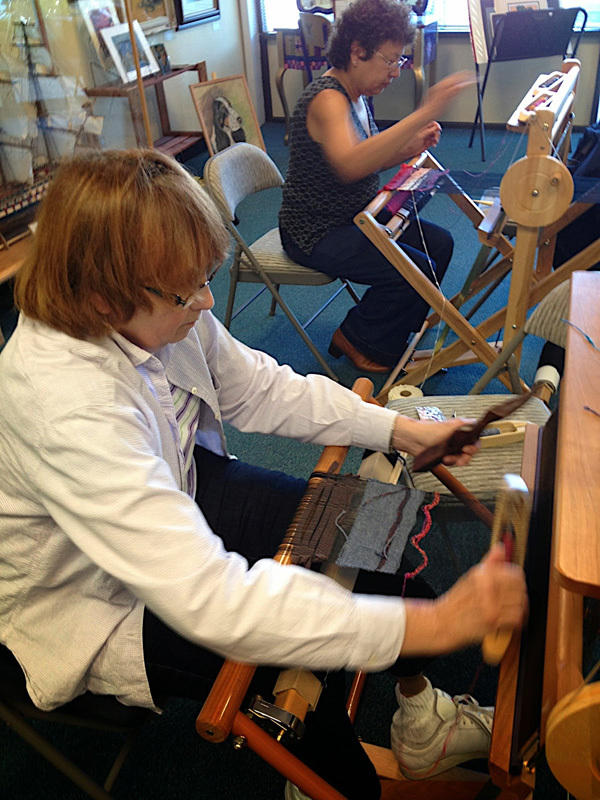 LEARN TO SPIN fibers using spinning wheels and drop spindles. Children through adults may come to learn without knowing a thing or come to get a review on spinning or refresh spinning skills. 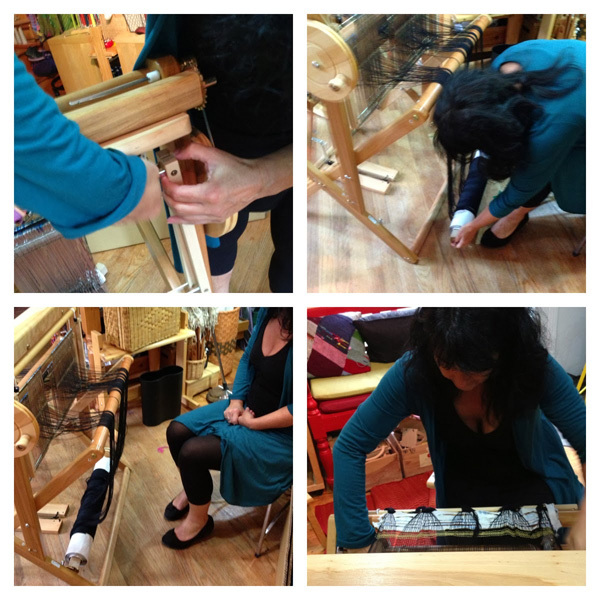 A fantastic way to add to your self creating vision is to use your own hand spun yarns in your saori weaving. 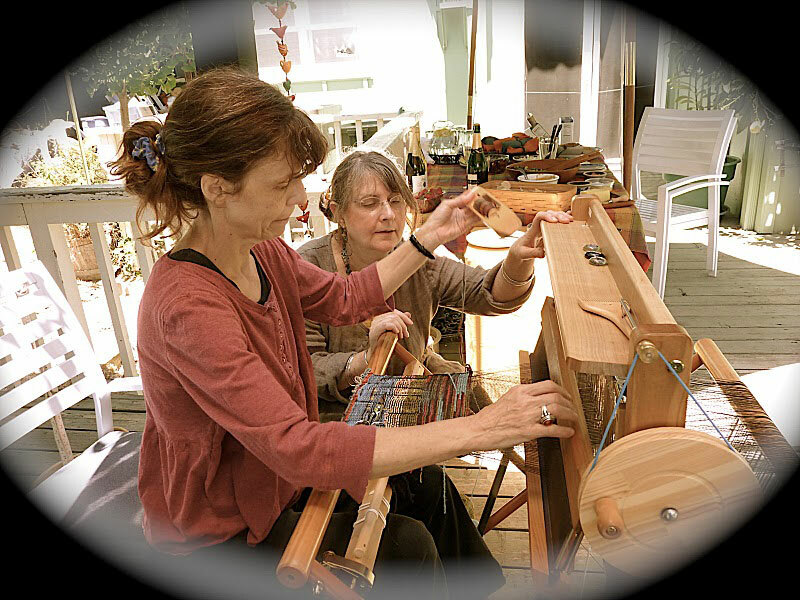 If you have always wanted to know how to make your own yarn from wool come and learn how peaceful spinning yarn can be. 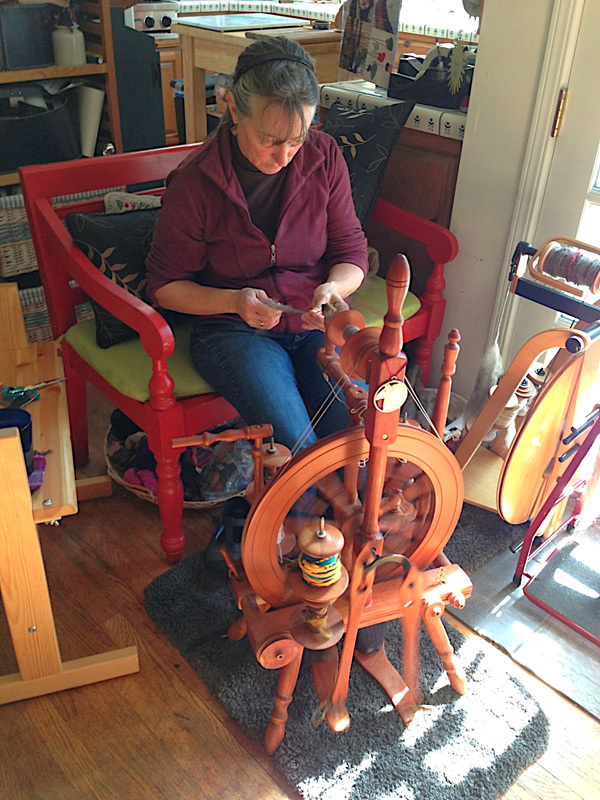 Spinning wheel rental available upon request and with deposit. This is a good follow up class to the trial class . Scheduled as 12 consecutive 2 hour classes. Classes may be scheduled in alternate blocks, such as 4 3-hour classes or 3 4-hour classes. Please note that some students may need additional hours to finish the class, which will be charged at $25 per hour. 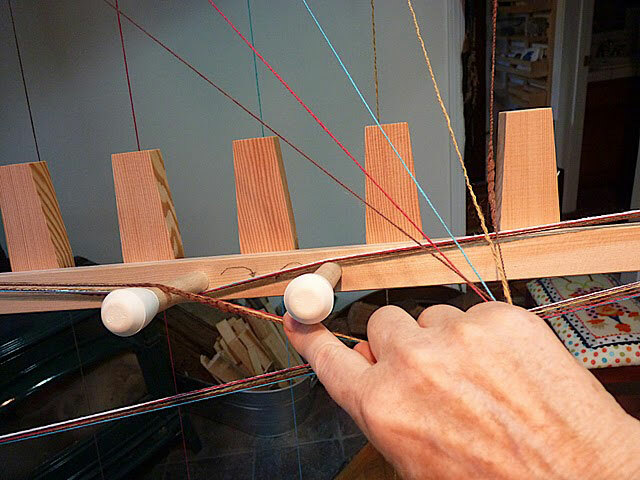 You will learn how to wind a warp with yarns of your choice Thread beam on and weave on a SAORI LOOM. Contact me for more details or options for this class. 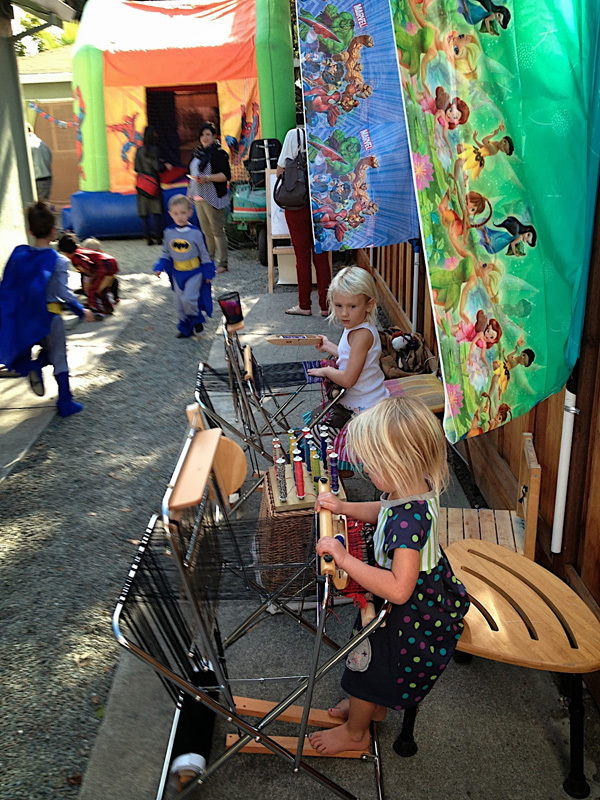 Spend a peaceful day in the santa cruz mountains surrounded by red woods and sun. 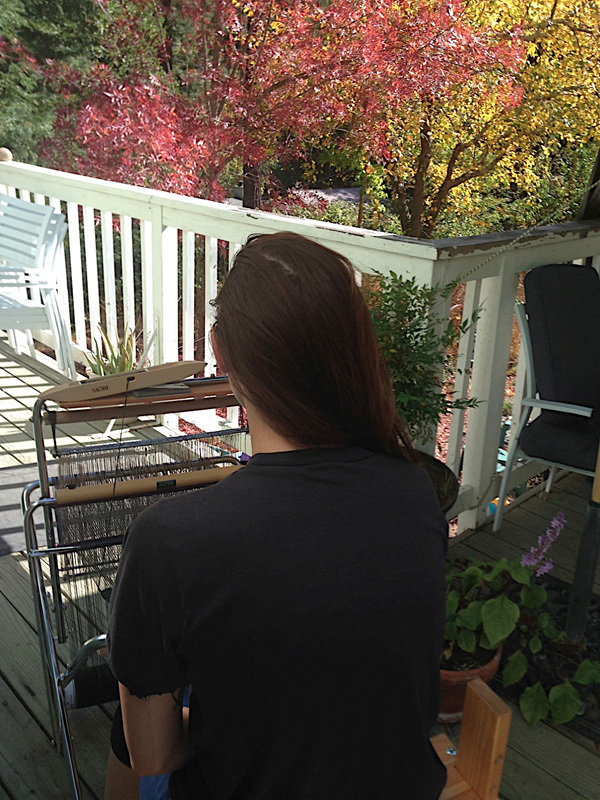 Weather permitting, you'll be weaving outside on the deck or under the trees or inside the weaving studio. This is a self-directed studio day with out time constraints. You will be using a pre-warped loom. 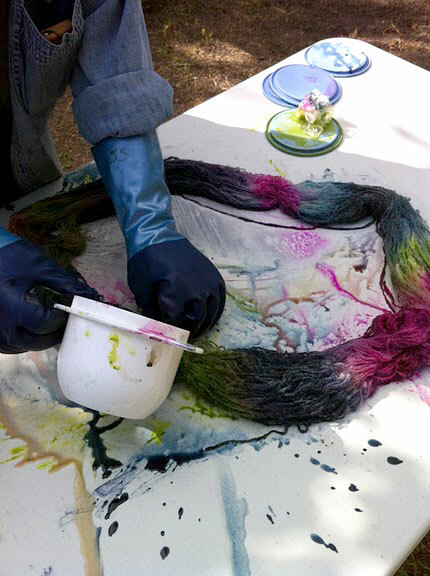 This is a class for students to learn how to dye cotton or wool warp or weft yarns by hand painting the dye colors on the skeins. 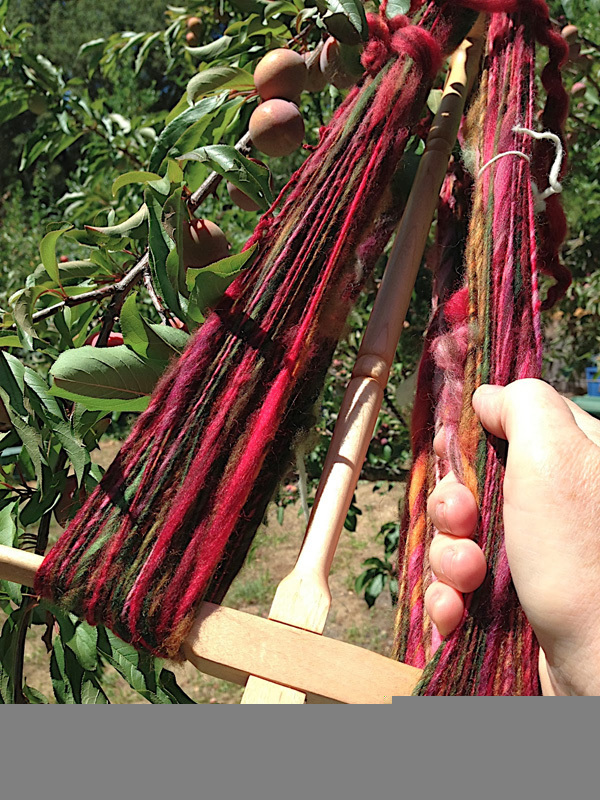 Students may also learn dyeing fleece and fiber for spinning or felting. This is where your intuition will come forward to create color combinations that just call to you with no rules. This is a all day workshop and available when the weather is permits since it's an outside activity. 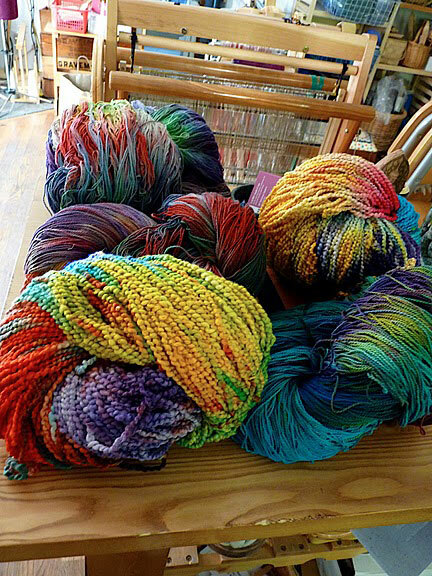 Wear old clothes and bring your yarns and a lunch and we will create one of a kind dyed skeins of yarn suited for either warps or wefts. 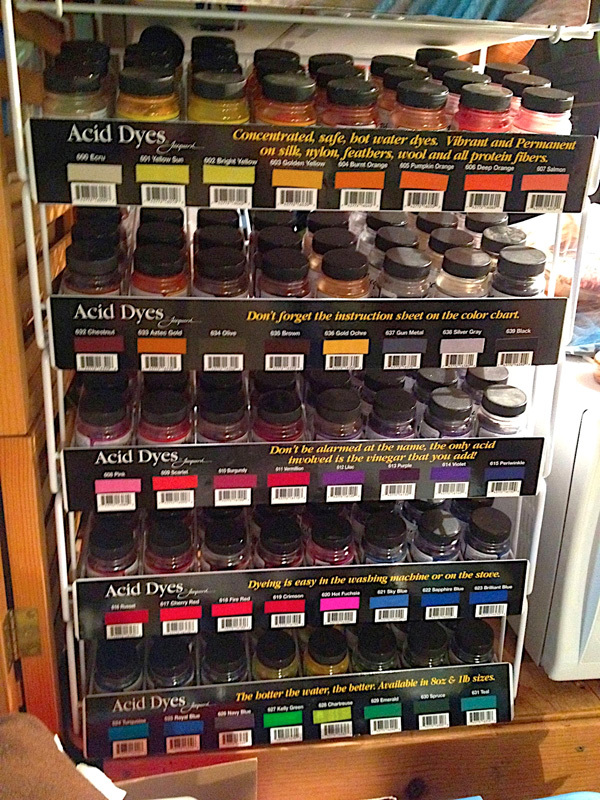 You can bring your own yarns or purchase un dyed yarns from me. Scheduled by demand. 3 enrolled student minimum. 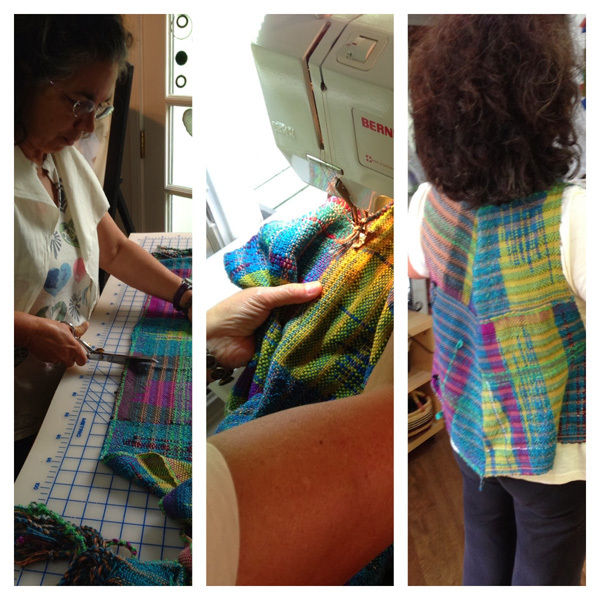 Come and have a one on one weaving class.PRESCHEDULED as are all of my classes. You do not have to know how to sew or own a sewing machine to create clothing. All levels from experienced to never sewn before. 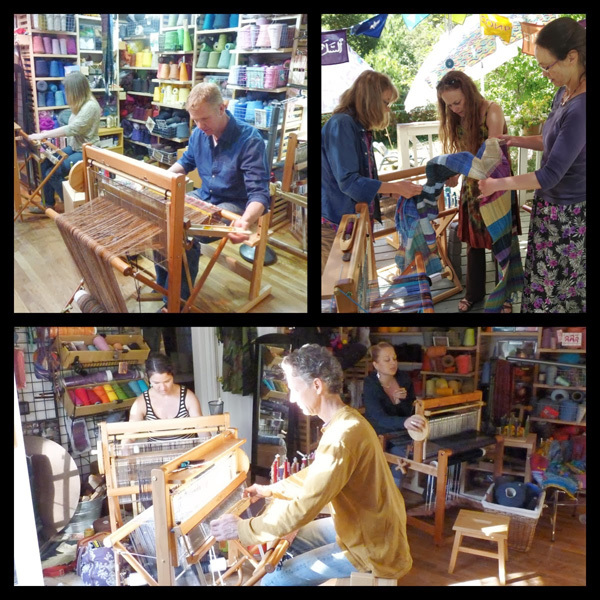 Come and get support for cutting into your hand woven cloth or your own regular fabric. Swiss Bernina sewing machines cutting tables and notions. Individualized help given. Saori has unique designs and approaches to clothing. It allows for much expression and fresh opportunity of garment design. Pre-class consultation recommended. 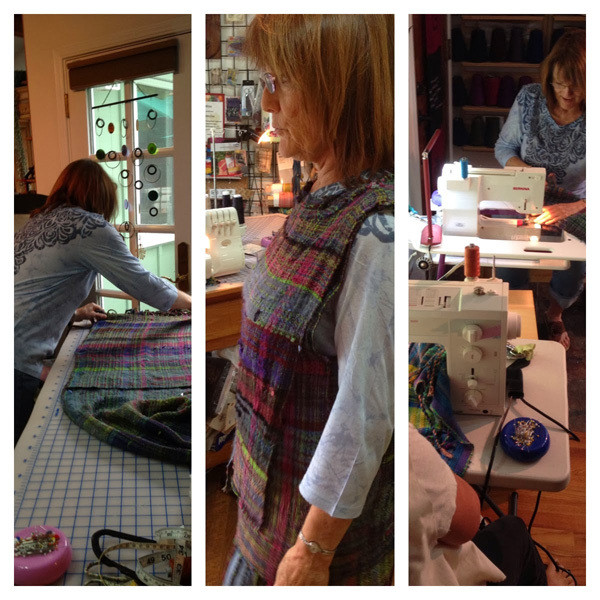 Classes in sewing regular fabrics and patterns taught as well. Create your own clothing and accessories with no fear and helpful guidance for your own vision. 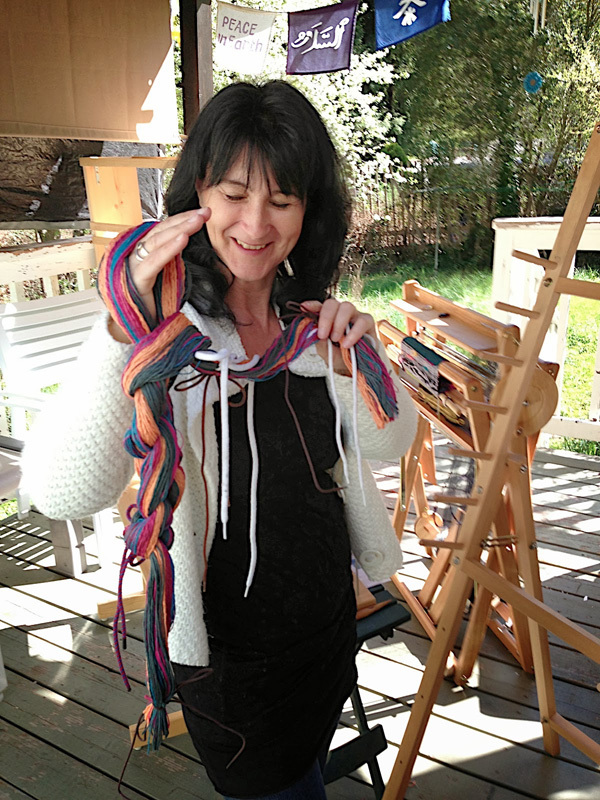 I have successfully taught and empowered 7yr olds through adults in clothing construction for many years pairing this art with weaving is very gratifying in continuing self expression through fiber. What a fun way to celebrate any occasion! 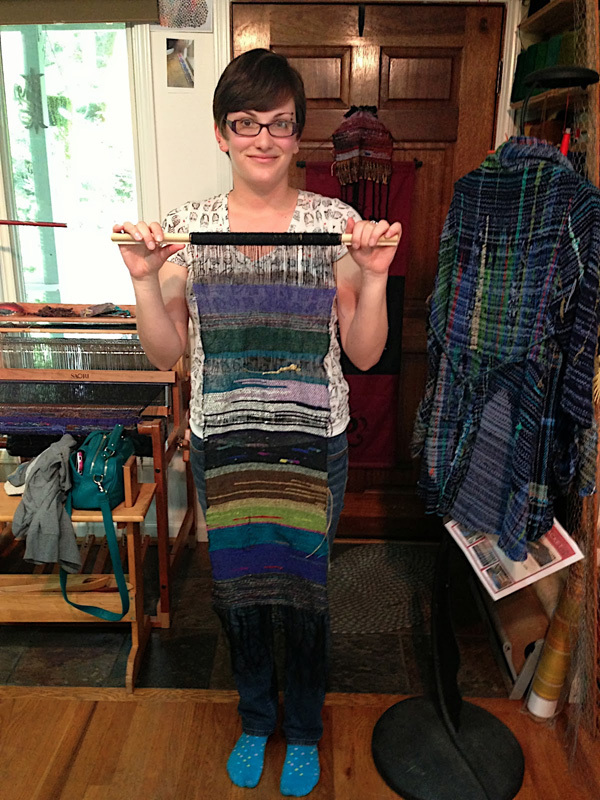 I will bring already warped, ready-to-weave Saori looms to your party. 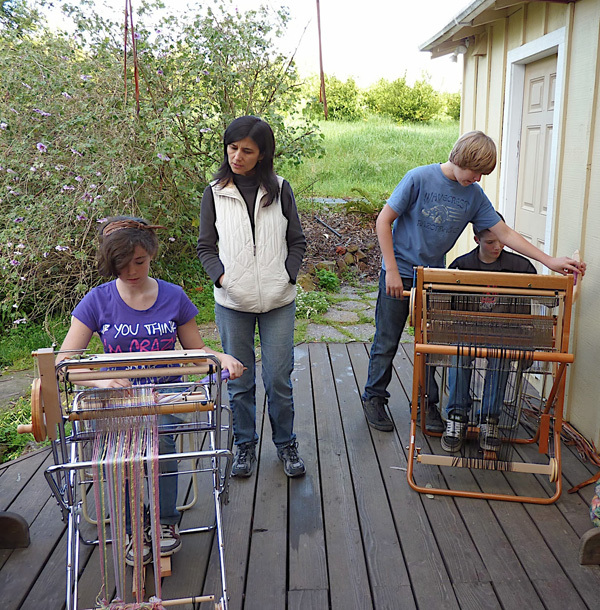 Children 5 years through teens and up will enjoy weaving with no previous knowledge needed. I can even bring a sewing machine and can sew a simple bag for the participants using their weaving (time permitting). 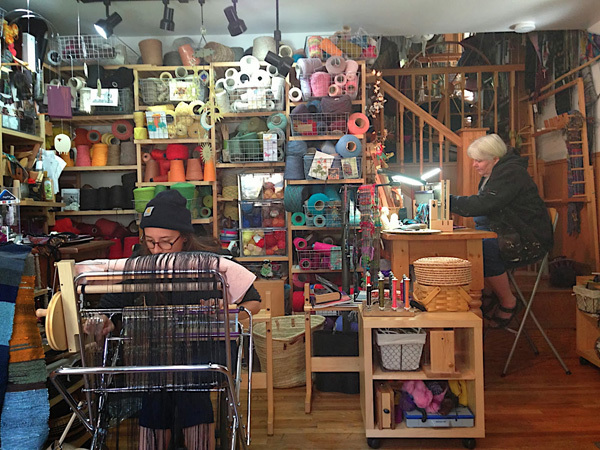 Prices vary by how long the session is (2 hour minimum) and number of looms. Materials are included. 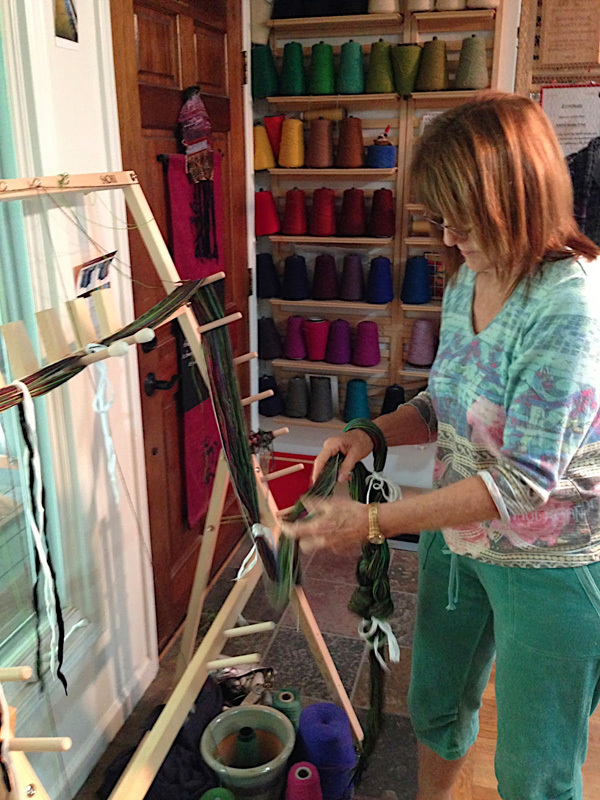 Learn to wind a special warp, dress a loom or learn new weaving techniques. Materials fees are additional. 40 mins. 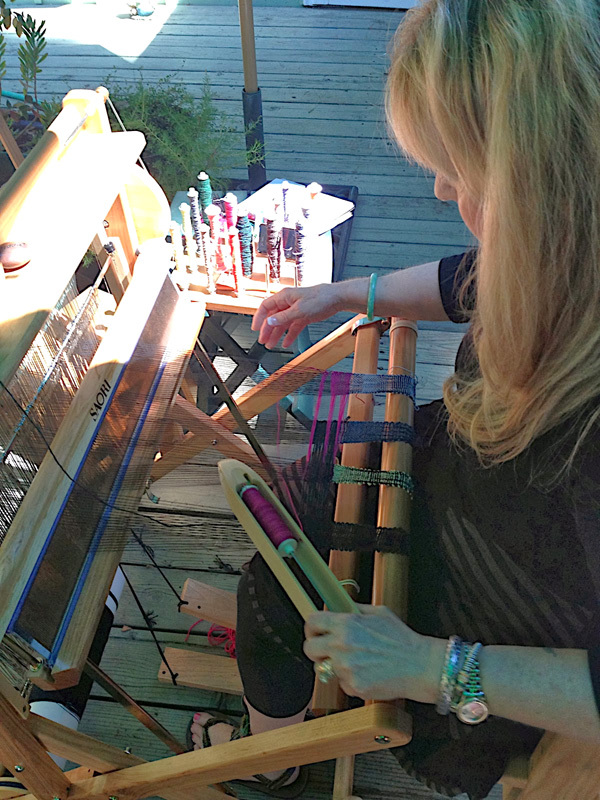 to 1 1/2 hours with one loom $125 to $250. 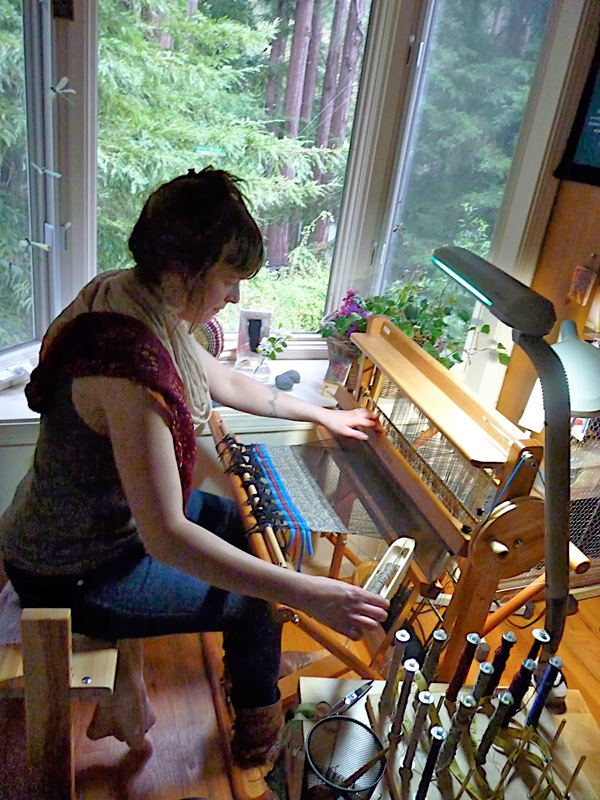 More looms and longer times available. Contact me for more details. *There are no refunds for missed classes, no make up classes.